Bowmore Limited Edition 1989 vintage 16 yo (51.8%): And here is the second and last sample I received this week from Jens Fischer a.k.a. Mr. Whisky-Quiz. 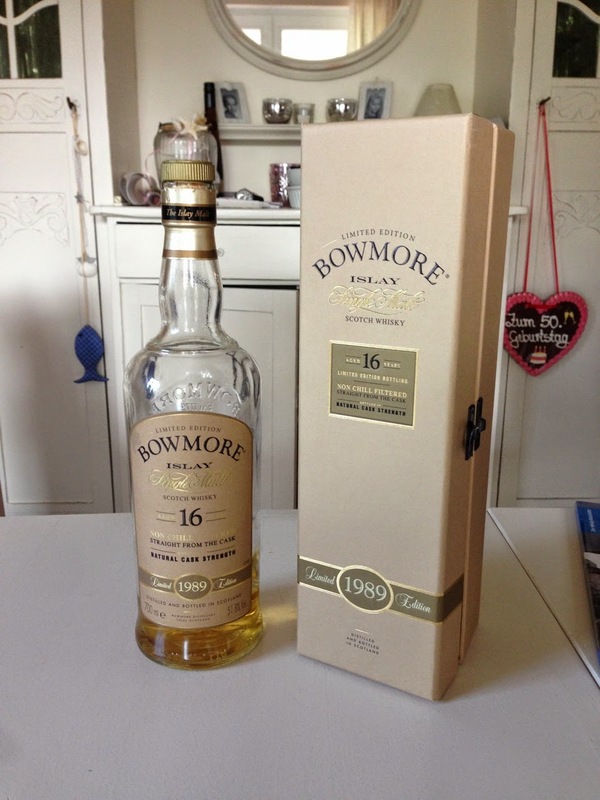 It is a cask strength Bowmore distilled in 1989 and the first in their vintage series. Aged primarily in ex-bourbon casks and it was the very first official Bowmore expression not to be chill filtered back then. The vat is a blend of 134 casks. Color: Pale, lemon chiffon. Chardonnay. Nose: Here we go... I'll be around here for about half an hour: Fresh, green and grassy. Very subtle and sweet peat, salty sea spray and green olive brine. Bitter greens, fresh cut grass and kumquat zest. Guava, seaweed, vanilla and cold pear compost. Gorgeous... Palate: What the what..? Hold your horses here! All of a sudden a bottle of perfume exploded in the glass (FWP..!). It's Christmas time, I am stuck at Macy's perfume department and desperately trying to find my way out... Rose water, lavender cologne, Chanel No. 5 and hyacinth flowers. I really didn't see this one coming... Adding some water cuts the alcohol burn but all the perfume notes are still there. Bone dry with oak tannins, very distant peat and artificially flavored raspberry soda water. Finish: Long and dry with white pepper and rose liquor notes. Damn, I still cannot focus straight. What was that all about? Overall: This is a very confusing dram... When I was nosing it I thought I found the holy grail but as soon as I tasted, the whole thing turned upside down. Like somebody swapped the glass or poured profusely perfume in it when I was typing my nosing notes. I am very baffled... I wish I never stopped nosing it. Well, needless to say it was quite an adventure. A very odd one but it was. Thank you again for sending me the samples all the way from the old world Jens..!